AIIMS Director and internationally renowned heart surgeon Dr P. Venugopal here today stepped out of Nirman Bhavan, Health Ministry headquarters, in a state of daze minutes after the institute body, chaired by Health Minister Anbhumani Ramadoss, announced the “termination of his term”. Health Minister Ambumani Ramadoss’ face-off with the All-India Institute of Medical Sciences doctors on anti-reservation agitation and withholding their salary for the strike period today got a severe beating with the Supreme Court reprimanding the government for going back on its promise of not taking any “punitive” action against medicos on their joining duty. Should the pre-medical entrance test be scrapped in view of the Baba Farid University leakage? The great Zinedine Zidane gave France a 1-0 win over Portugal today with a penalty that handed them a place in the World Cup final. The Punjab Police believes that Vikramjit Singh alias Vicky, the 22-year-old missing son of a Ludhiana-based industrialist, has been shot dead. The Baba Farid University of Health Sciences, which today declared the results of the Punjab Medical Entrance Test, said that no question booklet was missing. It will be the da- wn of a new era in Sino-Indian bilateral ties tomorrow when border trade between the world’s two most populous nations resumes through the famed Nathu la pass after a gap of over four decades. 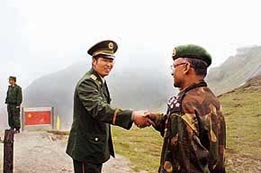 A Chinese army officer (left) exchanges greetings with his Indian counterpart following a meeting among the officers as they stand on the border of Nathu La, some 52 km east of Gangtok on Wednesday.